How can I process tabular data files in Python? Explain what a library is and what libraries are used for. Import a Python library and use the functions it contains. Read tabular data from a file into a program. Select individual values and subsections from data. Perform operations on arrays of data. Plot simple graphs from data. In this episode we will learn how to work with arthritis inflammation datasets in Python. However, before we discuss how to deal with many data points, let’s learn how to work with single data values. From now on, whenever we use weight_kg, Python will substitute the value we assigned to it. In essence, a variable is just a name for a value. A variable is analogous to a sticky note with a name written on it: assigning a value to a variable is like putting that sticky note on a particular value. Since weight_lb doesn’t “remember” where its value comes from, it is not updated when we change weight_kg. Words are useful, but what’s more useful are the sentences and stories we build with them. Similarly, while a lot of powerful, general tools are built into Python, specialized tools built up from these basic units live in libraries that can be called upon when needed. The expression numpy.loadtxt(...) is a function call that asks Python to run the function loadtxt which belongs to the numpy library. This dotted notation is used everywhere in Python: the thing that appears before the dot contains the thing that appears after. As an example, John Smith is the John that belongs to the Smith family. We could use the dot notation to write his name smith.john, just as loadtxt is a function that belongs to the numpy library. numpy.loadtxt has two parameters: the name of the file we want to read and the delimiter that separates values on a line. These both need to be character strings (or strings for short), so we put them in quotes. Since we haven’t told it to do anything else with the function’s output, the notebook displays it. In this case, that output is the data we just loaded. By default, only a few rows and columns are shown (with ... to omit elements when displaying big arrays). To save space, Python displays numbers as 1. instead of 1.0 when there’s nothing interesting after the decimal point. The output tells us that data currently refers to an N-dimensional array, the functionality for which is provided by the NumPy library. These data correspond to arthritis patients’ inflammation. The rows are the individual patients, and the columns are their daily inflammation measurements. A Numpy array contains one or more elements of the same type. The type function will only tell you that a variable is a NumPy array but won’t tell you the type of thing inside the array. We can find out the type of the data contained in the NumPy array. This tells us that the NumPy array’s elements are floating-point numbers. The output tells us that the data array variable contains 60 rows and 40 columns. When we created the variable data to store our arthritis data, we didn’t just create the array; we also created information about the array, called members or attributes. This extra information describes data in the same way an adjective describes a noun. data.shape is an attribute of data which describes the dimensions of data. We use the same dotted notation for the attributes of variables that we use for the functions in libraries because they have the same part-and-whole relationship. The expression data[30, 20] accesses the element at row 30, column 20. While this expression may not surprise you, data[0, 0] might. Programming languages like Fortran, MATLAB and R start counting at 1 because that’s what human beings have done for thousands of years. Languages in the C family (including C++, Java, Perl, and Python) count from 0 because it represents an offset from the first value in the array (the second value is offset by one index from the first value). This is closer to the way that computers represent arrays (if you are interested in the historical reasons behind counting indices from zero, you can read Mike Hoye’s blog post). As a result, if we have an M×N array in Python, its indices go from 0 to M-1 on the first axis and 0 to N-1 on the second. It takes a bit of getting used to, but one way to remember the rule is that the index is how many steps we have to take from the start to get the item we want. What may also surprise you is that when Python displays an array, it shows the element with index [0, 0] in the upper left corner rather than the lower left. This is consistent with the way mathematicians draw matrices but different from the Cartesian coordinates. The indices are (row, column) instead of (column, row) for the same reason, which can be confusing when plotting data. The slice 0:4 means, “Start at index 0 and go up to, but not including, index 4.”Again, the up-to-but-not-including takes a bit of getting used to, but the rule is that the difference between the upper and lower bounds is the number of values in the slice. The above example selects rows 0 through 2 and columns 36 through to the end of the array. will give you an array where tripledata[0,0] will equal doubledata[0,0] plus data[0,0], and so on for all other elements of the arrays. mean is a function that takes an array as an argument. Generally, a function uses inputs to produce outputs. However, some functions produce outputs without needing any input. For example, checking the current time doesn’t require any input. For functions that don’t take in any arguments, we still need parentheses (()) to tell Python to go and do something for us. NumPy has lots of useful functions that take an array as input. Let’s use three of those functions to get some descriptive values about the dataset. We’ll also use multiple assignment, a convenient Python feature that will enable us to do this all in one line. Here we’ve assigned the return value from numpy.max(data) to the variable maxval, the value from numpy.min(data) to minval, and so on. How did we know what functions NumPy has and how to use them? If you are working in IPython or in a Jupyter Notebook, there is an easy way to find out. If you type the name of something followed by a dot, then you can use tab completion (e.g. type numpy. and then press tab) to see a list of all functions and attributes that you can use. After selecting one, you can also add a question mark (e.g. numpy.cumprod? ), and IPython will return an explanation of the method! This is the same as doing help(numpy.cumprod). Everything in a line of code following the ‘#’ symbol is a comment that is ignored by Python. Comments allow programmers to leave explanatory notes for other programmers or their future selves. which is the average inflammation per patient across all days. Blue pixels in this heat map represent low values, while yellow pixels represent high values. As we can see, inflammation rises and falls over a 40-day period. The % indicates an IPython magic function - a function that is only valid within the notebook environment. Note that you only have to execute this function once per notebook. The maximum value rises and falls smoothly, while the minimum seems to be a step function. Neither trend seems particularly likely, so either there’s a mistake in our calculations or something is wrong with our data. This insight would have been difficult to reach by examining the numbers themselves without visualization tools. We will always use the syntax import numpy to import NumPy. However, in order to save typing, it is often suggested to make a shortcut like so: import numpy as np. If you ever see Python code online using a NumPy function with np (for example, np.loadtxt(...)), it’s because they’ve used this shortcut. When working with other people, it is important to agree on a convention of how common libraries are imported. What values do the variables mass and age have after each statement in the following program? Test your answers by executing the commands. What is the value of element[:4]? What about element[4:]? Or element[:]? What is element[-1]? What is element[-2]? Given those answers, explain what element[1:-1] does. The expression element[3:3] produces an empty string, i.e., a string that contains no characters. If data holds our array of patient data, what does data[3:3, 4:4] produce? What about data[3:3, :]? Why do all of our plots stop just short of the upper end of our graph? In the center and right subplots above, we expect all lines to look like step functions because non-integer value are not realistic for the minimum and maximum values. However, you can see that the lines are not always vertical or horizontal, and in particular the step function in the subplot on the right looks slanted. Why is this? 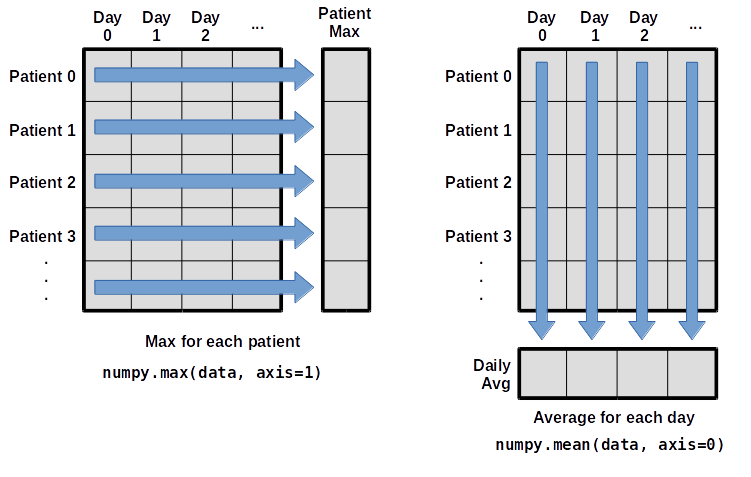 Create a plot showing the standard deviation (numpy.std) of the inflammation data for each day across all patients. Modify the program to display the three plots on top of one another instead of side by side. Arrays can be concatenated and stacked on top of one another, using NumPy’s vstack and hstack functions for vertical and horizontal stacking, respectively. Write some additional code that slices the first and last columns of A, and stacks them into a 3x2 array. Make sure to print the results to verify your solution. A ‘gotcha’ with array indexing is that singleton dimensions are dropped by default. That means A[:, 0] is a one dimensional array, which won’t stack as desired. To preserve singleton dimensions, the index itself can be a slice or array. For example, A[:, :1] returns a two dimensional array with one singleton dimension (i.e. a column vector). An alternative way to achieve the same result is to use Numpy’s delete function to remove the second column of A. This patient data is longitudinal in the sense that each row represents a series of observations relating to one individual. This means that the change in inflammation over time is a meaningful concept. Calling numpy.diff(npdiff) would do the following calculations and put the answers in another array. Which axis would it make sense to use this function along? Since the row axis (0) is patients, it does not make sense to get the difference between two arbitrary patients. The column axis (1) is in days, so the difference is the change in inflammation – a meaningful concept. If the shape of an individual data file is (60, 40) (60 rows and 40 columns), what would the shape of the array be after you run the diff() function and why? The shape will be (60, 39) because there is one fewer difference between columns than there are columns in the data. How would you find the largest change in inflammation for each patient? Does it matter if the change in inflammation is an increase or a decrease? By using the numpy.max() function after you apply the numpy.diff() function, you will get the largest difference between days. If inflammation values decrease along an axis, then the difference from one element to the next will be negative. If you are interested in the magnitude of the change and not the direction, the numpy.absolute() function will provide that. Notice the difference if you get the largest absolute difference between readings.